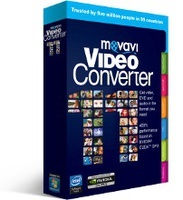 Movavi Video Converter is a simple, yet powerful video converter. With Movavi Video Converter, you can easily convert files between 170+ media formats, including HD and Flash video; save your video and rip unprotected DVDs for 180+ portable devices including iPad, iPod, iPhone, PSP, PDA, and cell phones. Tweak video with multiple editing features; split & join multiple video files; adjust video quality; extract soundtracks. You can share videos online, convert videos for YouTube and Facebook. If you need more information please contact the developers of Movavi Video Converter Personal (Movavi), or check out their product website.